Russell Wilson hit .229 with five home runs and 26 RBI in 93 minor-league games over two seasons with Class-A Tri-City and Class-A advanced Asheville before eventually finding NFL stardom in Seattle. The odds of Russell Wilson actually suiting up for the Rangers are slim, actually probably none, but that didn’t stop Texas from making some headlines Thursday by selecting former University of Wisconsin and current Seattle Seahawks quarterback Russell Wilson in the Rule 5 Draft. Wilson played baseball and football at North Carolina State from 2008-10 and was drafted by Colorado in the fourth round of the 2010 MLB Draft. 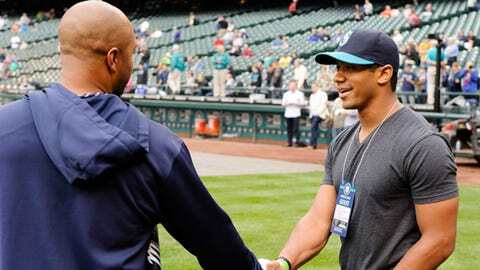 Although he was starring on the football field at the time, Wilson signed with the Rockies and played two professional seasons before giving up baseball for the NFL. Wilson’s desire to pursue professional baseball led to his departure from the Wolfpack and his ensuing transfer to Wisconsin. Wilson hit .229 with five home runs and 26 RBI in 93 minor-league games over two seasons with Class-A Tri-City and Class-A advanced Asheville. He gave up baseball after leading the Badgers to the Rose Bowl in 2011 and has no plans on returning to the game. "I want to assure all Seahawks fans that he will be under center at 1 p.m. Sunday afternoon," Wilson’s agent Mark Rodgers told FOXSports.com’s Jon Morosi. Rodgers told Morosi that Wilson is "thrilled" and "honored" to have been selected and was watching film at 6:15 a.m. in Seattle when he was picked. The Rangers used $12,000 on the pick, really just purchasing a motivational speaker as the star quarterback has no plans on becoming a two-sport professional athlete. Though Texas wants Wilson to come and speak to its minor-league players during spring training, Rodgers told FOXSports.com’s Ken Rosenthal that his client wants to be more involved. "Russell will want to take (batting practice) and ground balls," Rodgers told Rosenthal. "He loves baseball. This is the third time he has been drafted." Is there any chance Wilson ever changes his mind and returns to baseball? "I think Bo Jackson and Deion Sanders’ legacies are secure," Rodgers told Morosi. But if he does, Texas will at least control his rights. For the time being, they’ll get one heck of a motivational speaker.